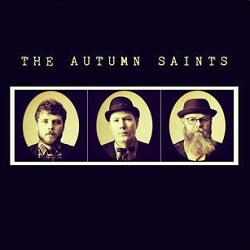 The Autumn Saints are an Oxford based trio of North Carolina born Britt Strickland on lead vocals, backed up by UK natives David Ireland on guitar and Joel Brisk on drums. Appropriately enough there’s a strong College Rock influence on their music across all of the six tracks on their debut EP, with a combination of chirping and intricate guitar lines swirling around the word-dense vocals. It brings a number of bands to mind. There is in Britt Strickland’s vocals some of Michael Stipes’ early R.E.M. stylings whilst the easy flowing melodic guitar work has at times a touch of other eighties guitar bands such as Big Country about it whilst on ‘Steady Again‘ the step-changing breaks recall a mid-period Roxy Music. On top of this throw in idiosyncratic drumming, well away from the regular rock beat. What does this all add up to? A very pleasing noise, with vocals that may not be the epitome of clarity but they more than compensate for this by having that other essential – an emotive earnestness that encourages the application of careful listening. The stop start of ‘I won’t know you’re gone‘ pulses with a malevolence that’s in the process of insidiously pulling people apart. It’s a trust broken and the finality of the drawing of a line under a friendship: “Reach into the dusk – rattle and rust / Fade or find – a matter of trust / Take my time; my time is wasted anyway; I won’t know you’re gone“. There’s a somewhat gentler side shown on ‘Getting Through to You‘ which throws in an acoustic intro, a few stabs of blues harp and still sways in a slightly 10,000 Maniacs way. ‘Dustbowl Year‘ is Woody Guthrie for the 21st century – wind blown farmers watching their crops fail, and faced with relentless and unending desperation. It swirls darkly, the dust devils choking as the band plays like yet greater dust storms rolling in from the horizon, shot through with dry lightning. It’s a glowing song that closes out an excellent EP. The Autumn Saints are going out on tour in Europe this October – it would be well worth watching for dates. The Autumn Saints are ready to rock many a college.